Raise Money by Hosting Jeffini's "Magical Mysteries SHOW" for a Family Enrichment Night! You can receive one of Jeffini's assembly programs for FREE! And have a family enrichment night with a terrific turn out!!!!
. . . all in only three short days. All of this can be done in only THREE DAYS by simply hosting Jeffini's Magical Mysteries Show for an evening family event. That's right... you simply host his amazing, Family Night show right in your school and raise funds by doing it!! You provide the place and promotion, The Great Jeffini provides a fantastic show! AND... if you host an evening show, Jeffini will provide one of his highly-regarded educational assembly shows at your school for FREE! You can choose one of the shows that best meets your students' needs from the shows listed HERE. Then that evening or a few days later, Jeffini brings his full stage comedy magic show for your family night. That show includes 60 - 90 minutes of hilarious, comedy magic, ventriloquism, illusions, and escapes. Jeffini takes on the roles of the Conjurist, the Illusionist, the Mentalist, and the Escapist in this rip-roaring, mind-boggling, family-friendly show. It's perfect for adults, youth, and children... so you can invite all of your school families, AND the entire community. you actually get smiles from your parents when you invite them to Jeffini's Show to help raise money for your worthy cause! Jeffini provides everything you need to have a successful event, including customized marketing materials, promotional ideas, and more than 50 tested fundraising "add-ons" to help you maximize your profits. We will even show you how to completely cover the cost of the show AND raise thousands of dollars through sponsorships. ​Fill out the form for your free packet of information about three ways that schools like yours have used this program to produce fantastic results. Don't miss out... get your free packet today. We would like to thank you for coming to Black's Mill and sharing your two outstanding magic shows with out students. The students were so excited after the daytime performance that they couldn't wait to come back to the evening performance two days later. 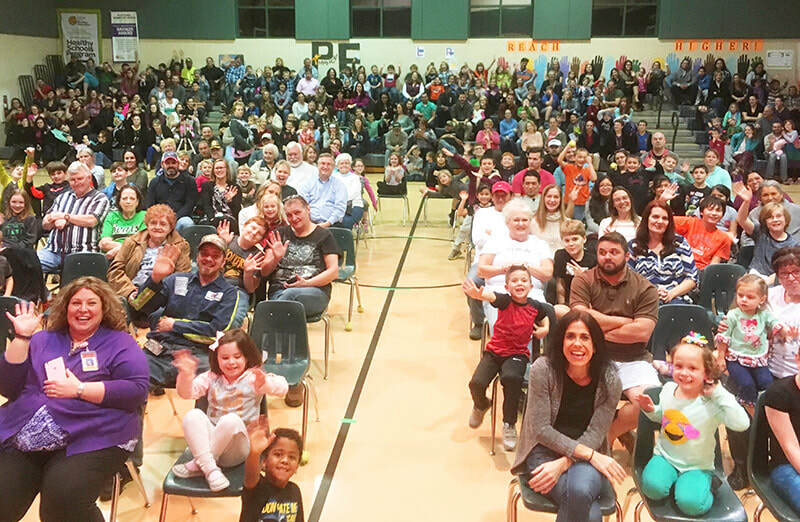 This was one of the largest gatherings that we have had for an event at our school for our students and families. Thank you for sharing your enthusiasm and energy with our students, and thank you for teaching them how to be a better friend. We wish you the best as you work with the children in the community. Thank you so much for hosting our Magic for Miracles show last month. The students and parents enjoyed your presentation and marveled at your magic tricks. We appreciate the fact that your presentations also teach important lessons about character including friendship and caring for others. The assemblies that you presented two days before the show were also wonderful for our students. The Buddy Blast Off show about making friends was fun and engaging for everyone. We hope to partner with you in the future for upcoming events. The Magic for Miracles night was an easy fund raiser for our school through which we raised over $1,000. We also appreciated the opportunity to help the local food bank in such a powerful manner. You provided all the materials and posters for the event and we appreciate your effort in helping make it a success for us.